Apricot Raisin Cake. 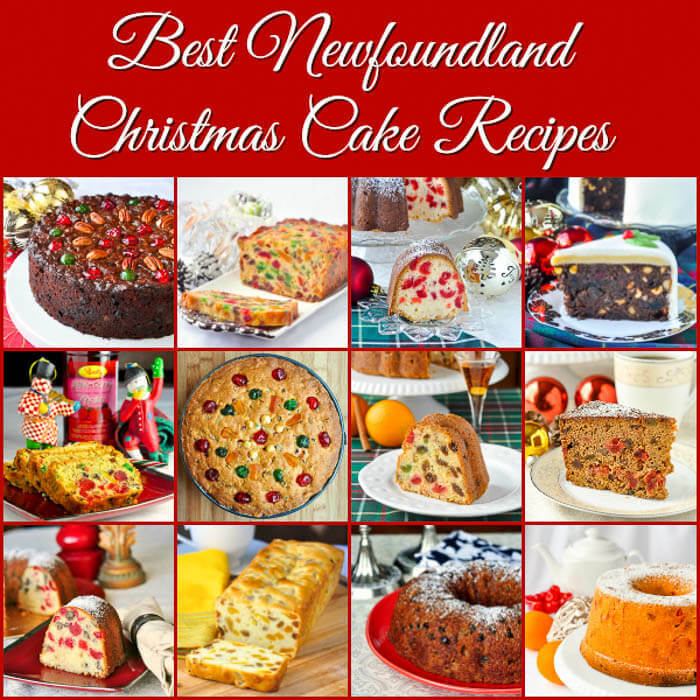 One of the most popular seasonal cake recipes here in Newfoundland during the Holidays, but it is easy enough to be enjoyed any time of year. 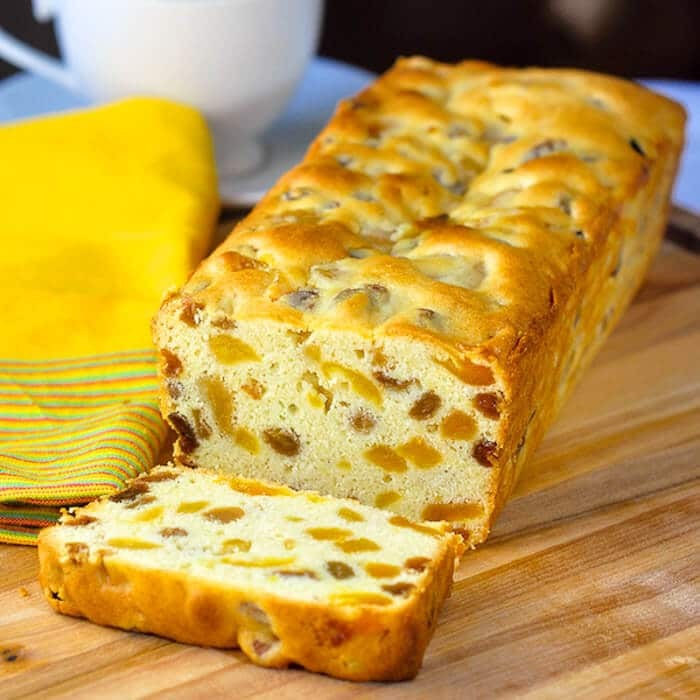 I know people from several different parts of the province who make a version of this apricot raisin cake at Christmas time and other special occasions. One friend even chose it as her wedding cake. Most of the time, I like to boil the fruit a day ahead of baking. This allows the dried fruits to soak up syrup which keeps them moist during baking and in turn assures a moist cake throughout. If using the boiled fruit on the day, make sure that most of the liquid has boiled off and it has a thick jammy consistency. Make sure that it is thoroughly cooled as well or your cake may not rise properly. The cake also freezes pretty well if you want to make it in advance. Making two small 8×4 inch loaf cakes is an ideal way to give one as a gift. Like this Apricot Raisin Cake recipe? You’ll find hundreds of other sweet ideas in our Cakes & Pies Category and even more in our Desserts Category. UPDATE: This recipe was successfully used as the base for a very good light fruitcake too. It’s already incredibly popular with our followers. Get that recipe here. For even more amazingly delicious Ideas like this be sure to check out our entire collection of Christmas Cake Recipes. 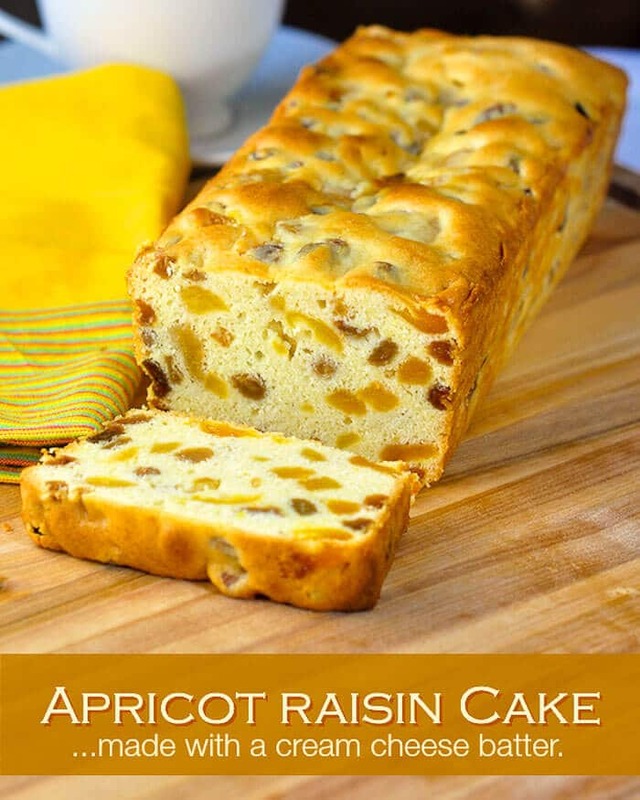 Apricot Raisin Cake is one of the most popular seasonal cake recipes here in Newfoundland during the Holidays, but it is easy enough to be enjoyed any time of year. In a medium saucepan combine the water, apricots, raisins, and water. Simmer very gently for 30 minutes. Cool completely. Cream the butter sugar vanilla extract and cream cheese until light and fluffy. Sift together the flour and baking powder. Fold half of the dry ingredients into the creamed mixture. Fold in the cooled boiled apricot mixture, followed by the remaining dry ingredients. Bake in a greased and floured tube pan or two small greased loaf pans at 350 degrees F for about an hour or until toothpick inserted in the center comes out clean. Baking times may vary on this recipe depending upon the amount of moisture contained in the boiled fruit mixture. The toothpick test is the best way to determine when it is done. my mom came to visit me and forgot this recipie back in St. john’s. Thanks for posting! Oh and th ecake turned out beautiful! We are sending it to my husband in Afganistan! Thanks again! I made this for my co-workers as part of a Christmas platter. It was not in the kitchen very long so I think everyone loved it. I thought it was creamy and delicious. It could use a little more tang, though – maybe I need a more sour sour cream. What’s with the ‘sour cream’Rachel? Absolutely LOVE this cake…..have made it several times and had great results each time. I even cut down on the calories by using half Splenda and half sugar, as well as 95% fat-free cream cheese. I love the tip about soaking the fruits overnight! I made this cake last Christmas and it was delicious. I want to make it again, but in just one loaf pan. Can I simply halve the recipe? Edie , she just used double cream cheese , no other additions ? I love this cake and always use my aunts recipe which calls for more cream cheese, I am going to make this for the middle layer of my son’s wedding cake and the cherry cake for the top layer.I will need to make the apricot cake bigger then the recipe.Hope it works good like it did before. I made this cake today and I put a can of Danish Cream in it. This time Iit in 2 loaves and wrapped one in an Apricot Brandy cheesecloth. We shall see how that turns out. Can’t wait to try it. Sounds like an interesting idea. Did you cut back on the cream cheese? do you need to age this cake? No. This is not that type of a fruitcake, this is more of a pound cake with fruit…if that makes sense. It should be baked and consumed within a few days if not frozen. In cleaning out my spice/baking cupboards yesterday, I came across little bits of dried fruit leftover from other recipes. I ended up using some raisins, dried cherries and dates in this recipe. It turned out wonderfully. It was just a little darker than yours, but it’s delicious! Thanks again, Barry! I love that you said to use your recipes as starting points. I was thinking of adding dried cranberries to the raisins and apricots. Do you think it will work? I’m sure it would. Sounds like an interesting combination. I don’t have sultana raisins in my cupboard. Can I substitute any other kind? Any raisins really. The darker ones tend to color the cake but it still tastes the same. Your recipe calls for butter…do you use real butter? Hi, Just wondering if I should drain the syrup from the fruit before adding to batter. Also, the bake time at top says one & a half hours but in the recipe it says to bake for 1 hour. Thank you! The cook time includes the time for the fruit mixture. Use the toothpick test to tell when it’s fully baked…and yes the syrup gets added to the mix. was just wondering the same thing. the apricots and raisins have been soaking for about 5 hours (after the 30 minute simmer) and there still seems to be a LOT of liquid in the pan. i don’t plan to make it until tomorrow, but can’t imagine the fruit soaking up any more of the syrup. will trust what you say, however. thank you for the wonderful recipe. it’s my first time trying it & look forward to the results as i am a person who does not like traditional fruit cake. Hi I just made this cake and a disappointed . As I made another cakes the same and it called for 4 tsp of baking powder and they rise perfect light and great moist So any ideas hat could have happen. This is meant to have more of a dense, pound cake like texture. How old was your baking powder? Want to make. this today… have the fruit ready to go.Can I put in a full pack of cream cheese? And if so should I make any adaptations to recipe? You will upset the balance of flour to fat in the recipe if you do that. You say to bake in bundt pan or two small loaf pans.How big should the loaf pans be? Not large. Mine are medium-ish. If I use the small disposable foil loaf pans, do you think 2 or should I use 3.
can you cook the fruit in liquor? You could replace some of the water. he Apricot Cake and the Cherry Cake turned out prefect for my son’s wedding cake. Thank you Barry for all your help. I love your Rock Recipes. So happy to be just a small part of the special day. Best of luck to the Newlyweds! If I use unsalted butter…should I add salt? I mostly use salted butter for baking and add no extra if a recipe calls for it. but the out-come was so good. I am making this cake for a charity auction and was wondering what kind of icing would be best? Do you have a recipe for the icing? Thanks for your reply. It is good with cream cheese frosting! Hi Barry…For medical reason my daughter is gluten free..I told her I would make this cake for her…would this cake be good with gluten free flour..or any recommendations?? I have no experience with that I’m afraid. You could try using an all purpose blend. Made this several times….It is a big hit in our house hold. No problems with it at all. Going to make it again today. Made this cake yesterday.baked it for 90 min on 325f.when I cut it it was really crumbly abs was falling to pieces…..not a smooth texture.Any ideas why. You made a major error in measuring somewhere. This definitely NOT a dry cake. Quite the opposite. Making this now and the fruit mixture smells like it would be nice with a little rum added in? What do you think? Interesting idea. Did you try it? I didn’t try it but I certainly will next time! I’m thinking soaking the apricots in rum would be good and maybe adding some flaked coconut to the batter too! I’ll post if it works out! Great recipe! Thanks! Can this be made with fresh apricots???? I’ve never tried but it would take some modification to the liquid amount. I have 2 lbs. of glace apricots leftover from Christmas. Can I use them in this recipe? I don’t think I would need to soak them since they are already plump. Never used those. Worth a try. Hi Barry. Just wondering when fruit mixture is soaked overnight, does it need to be refrigerated? Thinking it is necessary to boil the raisins for this cake…I usually do but was planning on doing another cake that just called for 3 cups of apricots and no raisins but now I want to go ahead and do this one again wondering if I should boil the raisins before adding. I have not made this cake any other way than in the instructions and I do not recommend any changes. I made 2 loaves of this. Lovely! Very moist and delicious! Thank you for this recipe!